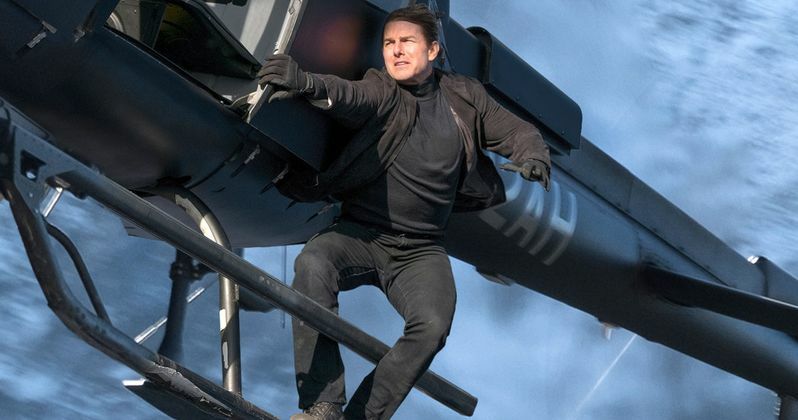 Paramount Pictures has just released a new preview for Mission: Impossible - Fallout, which gives fans a closer look at the incredible helicopter stunt first seen in the Super Bowl trailer released this past Sunday. Long before production on the movie began, producer David Ellison teased that Tom Cruise will be pulling off his most death-defying stunt ever in this movie, which took many fans by surprise after 2015's Mission: Impossible: Rogue Nation, which opened with Tom Cruise holding onto the door of a cargo plane as it took off. Now it's clear that the producer was telling the truth, as we go deeper into harrowing scene. While there are no details as to how this stunt fits into the story, or where in the movie this scene will take place, this preview begins with director Christopher McQuarrie, the first filmmaker to direct two Mission: Impossible movies back-to-back, revealing that this stunt has never been attempted before. We also hear from aerial coordinator Marc Wolff, who mentions how much skill is involved in flying a helicopter, while putting an actor like Tom Cruise in this type of situation. Aerial assistant Randy Hepner also reveals that Tom Cruise came to him, and bluntly stated that they were going to go to Airbus and learn how to fly a helicopter, to become a "2,000-hour pilot" in a very short amount of time for this death-defying stunt. Marc Wolff also mentions that it takes "three months of eight-hour days just to become a novice pilot," adding that Tom Cruise basically worked around the clock to get to the incredible level of skill needed for this stunt. The video also features Airbus chief instructor Tim McAdams, who states that there are very few students who have the level of dedication and focus that Tom Cruise possesses. Producer Jake Myers adds that they had to change the way they filmed aerial scenes like this, with a number of camera rigs actually pointing inside the cockpit, to show that Tom Cruise's character Ethan Hunt is actually piloting this helicopter with no additional assistance.. There is also footage of Tom Cruise meeting with all of the other helicopter pilots and director Christopher McQuarrie, to discuss the positioning of each helicopter, which is one of the most dangerous aspects of the stunt because there are 13 helicopters in the production, with many of them positioned quite close to each other. The preview comes to a close with a glimpse at the "corkscrew turn" that Tom Cruise pulls off, which the crew members reveal most pilots wouldn't even attempt because it's incredibly challenging and takes a high degree of skill and practice. The preview shows this turn from a number of different angles, and when Tom Cruise pulls it off, he asks his director "McQ," how it looked, with the director responding, "Very upsetting here," which Tom Cruise responds by stating, "Well I guess that's a print." Tom Cruise has become quite the action icon for pulling off incredible stunts like this on his own, and he may have set a new standard for death-defying stunts once again in this movie. Perhaps the most ironic thing about this movie is that Tom Cruise didn't get hurt while filming this helicopter scene, but instead he was sidelined for weeks after breaking his ankle for another stunt where he was jumping onto a rooftop. While the production was shut down for several weeks, Paramount never pushed the release date, with the movie now slated to arrive in theaters on July 27, going up against Warner Bros. Teen Titans Go to the Movies. Take a look at this new preview, courtesy of Paramount Pictures YouTube.